Indiana Tech president Karl W. Einolf, Ph.D., and Indiana State Police superintendent Douglas G. Carter signed an agreement today to make Indiana Tech a preferred education partner of the Indiana State Police. 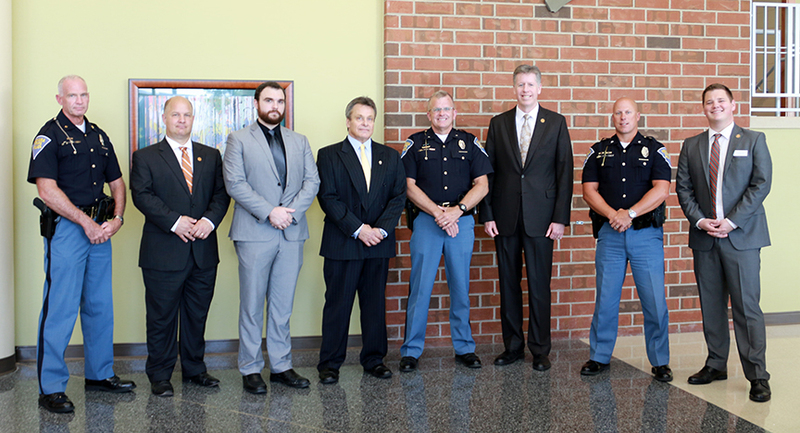 As the primary tenet of the agreement, Indiana Tech will provide corporate scholarships to current and former Indiana State Police troopers, current and former ISP staff members and all spouses who wish to take undergraduate and graduate classes through the university’s College of Professional Studies. Eligible participants will receive a scholarship to help make tuition even more affordable while pursuing their degree. In addition, current or retired troopers who wish to pursue a Bachelor of Science in Criminal Justice will receive credit for their academy training, making the path toward their degree shorter. Finally, textbook rental is included in the cost of tuition and books are shipped to students’ homes prior to the start of class. Indiana Tech has been helping students achieve their educational goals for more than 85 years. Now, even more students are able to achieve through the flexibility and convenience provided by Indiana Tech’s College of Professional Studies. CPS courses are five and six weeks long and held once a week, online or in person at one of the university’s 18 regional campuses. This format helps busy working adults make quick progress and build momentum toward the completion of their degree. Indiana State Police employees interested in taking advantage of this opportunity can learn more at CPS.IndianaTech.edu/indiana-state-police.